Chose a rainbow of large sweet bell peppers to stuff—go ahead and prep them to stand upright in a baking dish or cut them in half lengthwise so they lie on their sides. It’s easier to really stuff them this way. Par-cooking the peppers and basically filling them with a fully cooked meat mixture means they just need a final shot of heat to melt the cheese. Replace the rice with another quick-cooking grain. Try quinoa, bulgur wheat, or a small pasta like orzo or pearl couscous. Sprinkle a handful of chopped fresh oregano or parsley over each pepper before serving. This heirloom original recipe for stuffed peppers with rice is terrific just as it is, but it also lends itself to creativity and customization. Does your family love the spices of Tex-Mex cooking? This recipe is delicious with cumin and cayenne added. Do you have a vegetarian to feed? It’s simple to swap out the beef for a drained and rinsed can of beans. When you need to cut calories, ground turkey works great here. 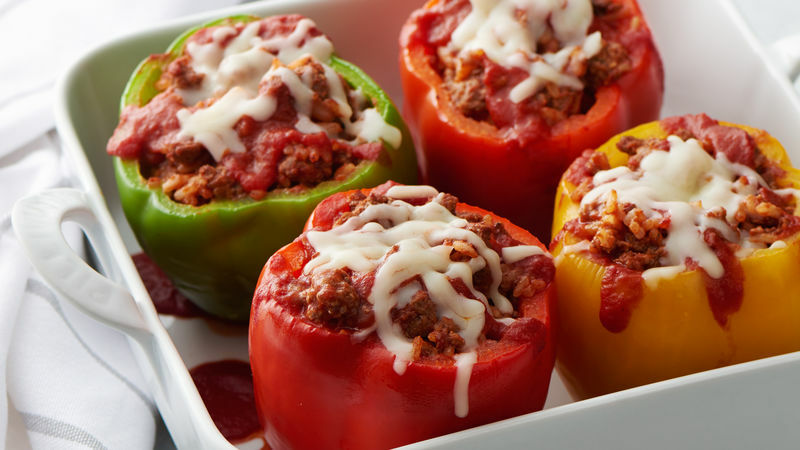 If you’d like to learn more about how to make stuffed peppers, check out Betty’s advice on cooking with bell peppers to learn how to pick the best peppers, how to store them and how to cut them. If you’ve already grown to love Betty’s original stuffed bell peppers, try another of Betty's best dinner recipes.